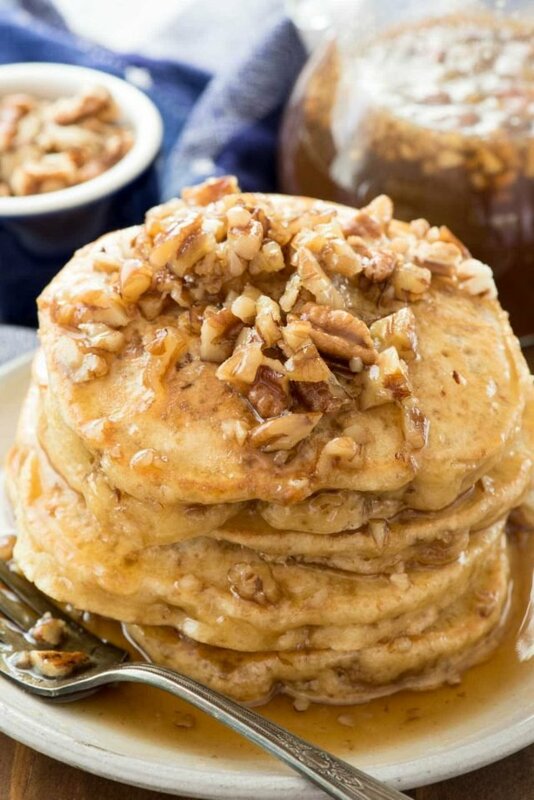 Butter Pecan Pancakes – this easy recipe is the BEST PANCAKE RECIPE EVER. The flavor tastes just like butter pecan ice cream, especially with the butter pecan syrup! It’s kind of freaky how Google just KNOWS me. On my phone, on my computer…it just knows what I want even if I haven’t been searching for it. Does it do that to you? You know, when you start typing in a question like “how do I make…” and it suggests answers for you? Sometimes it knows what I’m asking and I’m not sure how. Does my phone read my mind? Are the robots taking over the world? In Homeland, why does Carrie speak French in an Iranian hotel? I almost screamed and dropped the phone. BIG BROTHER IS LISTENING. Seriously, the same exact thing happened when I was searching butter pecan the other day. I typed in butter pecan and what did I get? 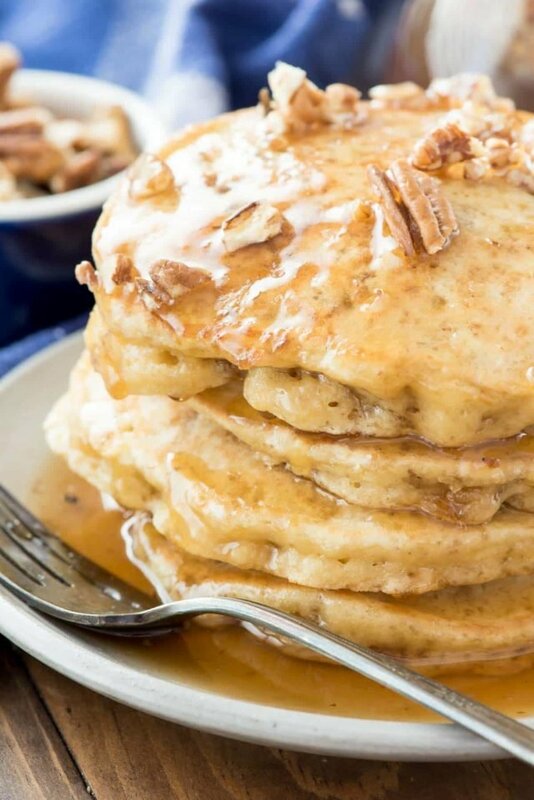 PECAN PANCAKES. Everyone else in the world types butter pecan and gets ice cream. Me? I GOT PANCAKES. And it was breakfast time. AND I WAS HUNGRY. It was a sign from the google gods. I needed to make pancakes. And that, my friends is how I created the BEST PANCAKE RECIPE YOU’LL EVER EAT. Butter Pecan Pancakes is the best pancake recipe you’ll ever eat. First of all, the smell. The smell of these pancakes made me think I was making ice cream on the griddle. My mouth is watering right now just thinking about them. They tasted like cupcakes. Or muffins. Or butter pecan ice cream. Seriously, I will NEVER EVER make another pancake recipe. The butter pecan in the pancakes plus the butter pecan syrup? OMG just get me a wheelbarrow because that’s how they’re rolling me out of my house forever and ever goodbye. How did I make these butter pecan flavored? With International Delight Southern Butter Pecan Coffee Creamer, of course. As you all know I love my International Delight and I use it in all sorts of recipes, like ice cream and cheesecake and cookies and french toast. Anything you can use milk in, you can use creamer. PANCAKES ARE NO EXCEPTION. 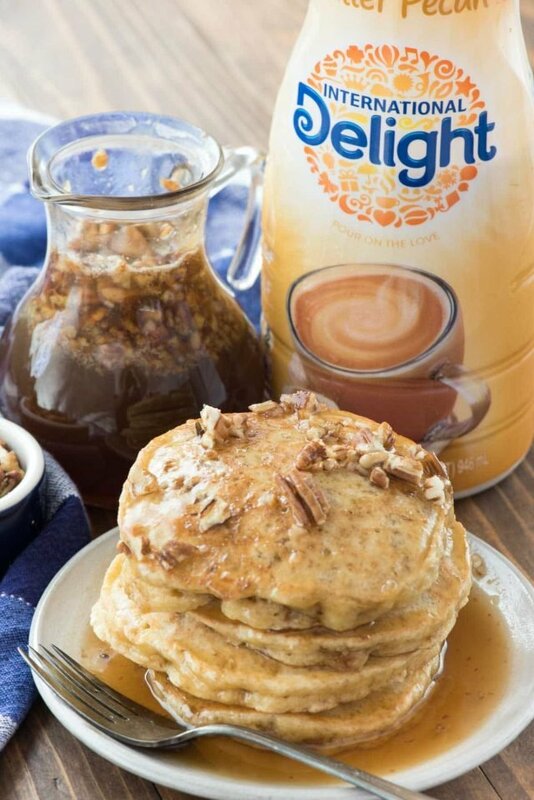 Pancakes are such an easy recipe that it’s easy to flavor them up with coffee creamer. There are so many options! Plus, if you happen to be out of milk and still want pancakes (#truestory) you can still make them from scratch! And, um, don’t forget the butter pecan syrup. Just give me a straw! Instead of granulated sugar, I used brown sugar instead. To me, brown sugar and butter pecan go well together. Instead of adding milk, I used the aforementioned coffee creamer. The smell of just the creamer is amazing! I added chopped pecans to the batter. Don’t over cook these pancakes! The syrup isn’t mandatory but butter + real maple syrup? And vanilla? Heaven, and it compliments the pancake flavor perfectly. 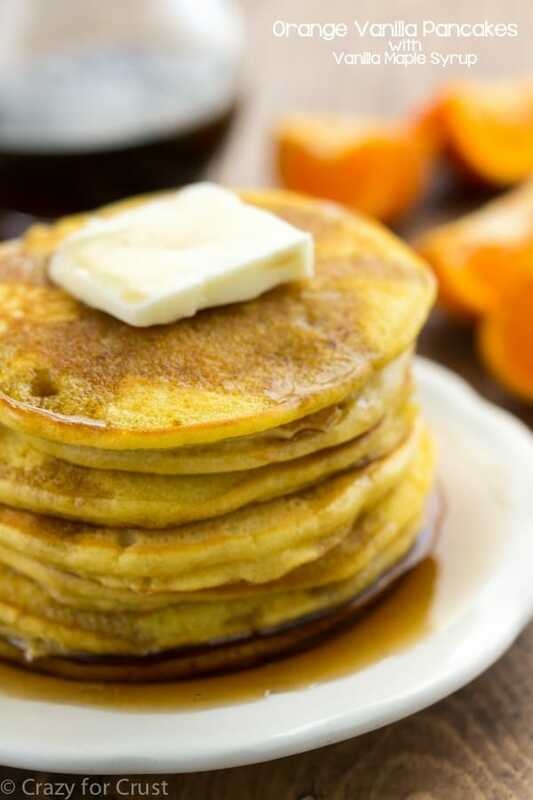 Butter Pecan Pancakes - this easy recipe is the BEST PANCAKE RECIPE EVER. The flavor tastes just like butter pecan ice cream, especially with the butter pecan syrup! Whisk flour, brown sugar, baking powder, and salt in a large bowl. 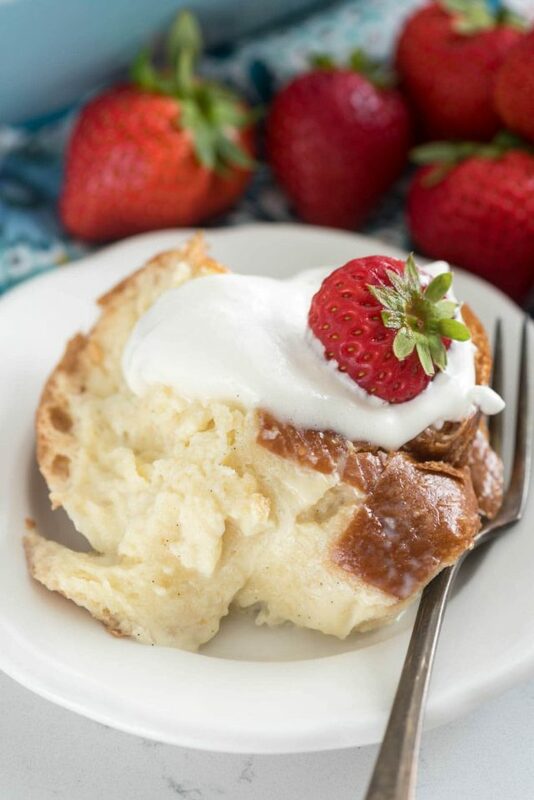 In a large measuring cup, whisk the eggs, coffee creamer, and melted butter. Whisk the wet ingredients into the dry and then stir in pecans. Batter will be thick and slightly lumpy. Scoop batter onto hot griddle after spraying with nonstick cooking spray. Bake until brown on both sides. That’s creepy and weird about Google but I am not surprised because I have that happen too! It’s like it reads my mind and fills in what I am about to ask when I google how to make…or random things. Weird. These pancakes. Epic! I wish this was my breakfast right now! These sound like a great idea for the morning after Thanksgiving or maybe Christmas breakfast…??? As for your google search, I believe it is because someone else has searched that same thing (probably lots of people). It’s so true about the google thing. it is really fun to go on sometimes and start typing to see what it populates…why are people googling some of these weird things??? these pancakes sound AMAZING. Butter pecan has always been my favorite ice cream flavor and now I’m going to need to try these pancakes. They look amazing!! I’ve had google do that to me when I’ve been typing a search. It’s so creepy! Homeland is a fantastic show. Claire Danes is amazing. My hubby and I both LOVE butter pecan. 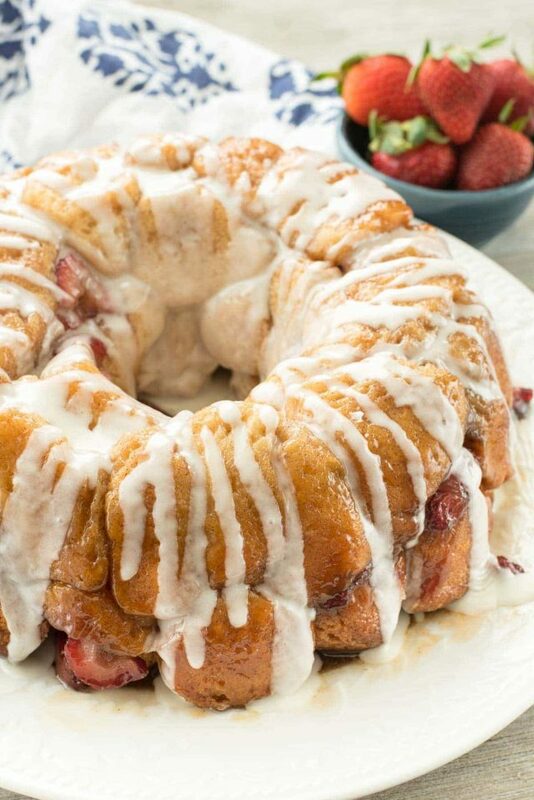 What a brilliant idea to use creamer in the recipe! Can’t wait to try this…printing now. I love pancakes and how people get so creative with pancake recipes! Ealier today I saw a banana-coconut one and now this one, I don’t even know where to start anymore hahah x) But I’ll sure try them all!